QUESTION: I remember your forecast that the pound would fall to par back in 1983. I thought you were mad, whilst something inside me captured my attention. 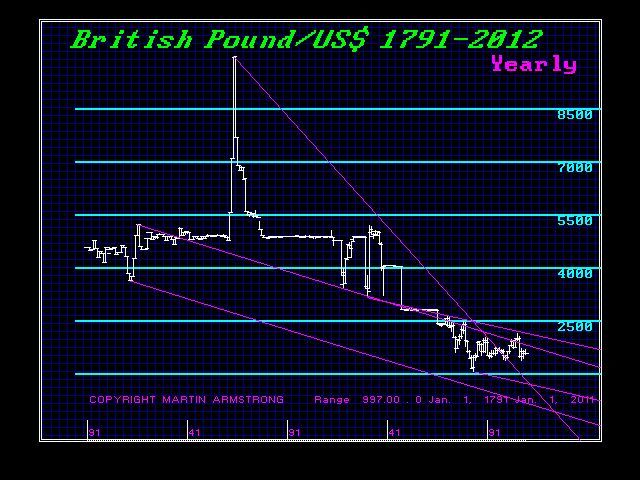 When our beloved pound fell to par, I attended every one of your London seminars after 1985. You have my attention. When you say the dollar can go “above” the 1985 high, just how far “above” is above for us here in the UK? ANSWER: Yes I remember doing a TV interview on FNN back in the early 1980s before it became CNBC. I remember the pound had peaked in 1980 at $2.45. When I said it would fall to par by 1985 the journalist almost choked. I did that interview side-by-side with Walter Bressert. The journalist turned to Walter and asked what do you think of that forecast? Walter said he would not bet against our computer. 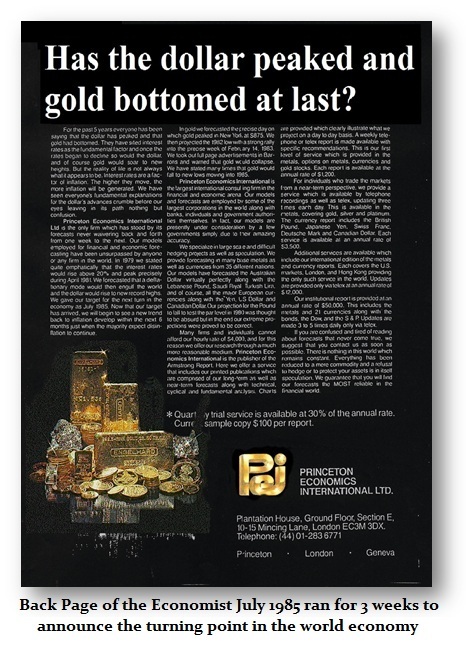 We took the back page for 3 weeks of the Economist in 1985 to announce the trend was changing again and that the deflation was over. I hate to say this again because I really loved living in London. It was my favorite city in the world. Perhaps the markets will force the political change and Nigel Farage will rise to drag Britain out of the Marxist Era. But as you know, we had a team of staff in London working daily at the Royal British Newspaper Library collecting data on everything that moved. So forgive me, but the pound could fall to the 65 to 70 US cent area at the worse case scenario by 2015. I know that sounds off-the-wall and it is about a 50% fall. But drastic movements are necessary to force drastic political change. 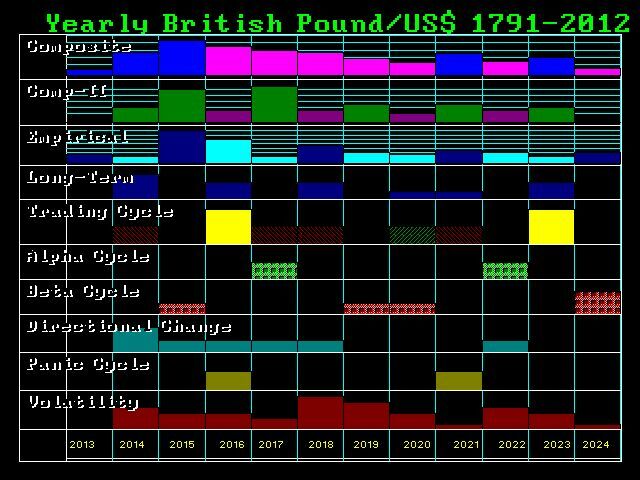 That is the technical projection using the database we gathered against the dollar from inception 1791 to date. The short position in the dollar and the obstinate European Parliament is so bad, it will take a blinding shock wave to force political change. This is what the pound-dollar view looks like. The spike high is the US Civil War. When we look at the timing array you can see the 2015/2016 turning point. Now look at the volatility coming after that target. It is going nuts on top of the Panic Cycles in 2016 and 2021. Look at the Directional Changes starting in 2014. This is warning of unbelievable confusion and tremendous oscillations that will break the backs of men and put on trial the philosophies of decades. We are working on this special currency report. We have a huge waiting list for this one. I doubt there will be a serious institution that does not order this one. This is most likely going to be the trade of the century – currencies. We will advise when it is ready and it will be posted on the Swiss site where you will be able to pay and pull it down at the same time.